Defying its charter from England’s king, the Massachusetts Bay Colony set up a mint in Boston in 1652. Its output consisted mostly of silver shillings, coins valued at twelve pence. The Massachusetts Mint later produced smaller silver coins valued at six pence, three pence and two pence. 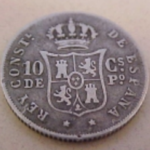 Except for the twopence pieces, which were dated 1662, all of the coins minted at Boston carried the date 1652. The colonists had to do this, since a new English king had come to the throne in 1660, and he was angry that his exclusive right to coin money had been violated. 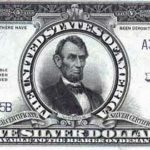 The colonists successfully maintained their deception that all of the silver pieces had been minted in 1652 by continuing to use that date for thirty years. 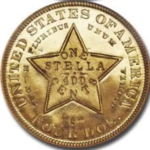 This was the first native coinage of the New England colony. The coin shows a Pine Tree within a beaded border surrounded by the legend IN MASATHVSETS (other spellings are possible). The reverse shows the date and the denomination XII (pence) below (12 pence=shilling). Around is the legend NEW ENGLAND AN: DOM (New England in the Year of Our Lord). 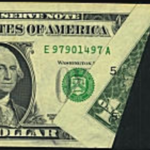 The mint’s first silver shillings bore simply the letters NE (for New England) on the obverse and the values XII (12 in Roman numerals), VI (6) or III (3) on the reverse. 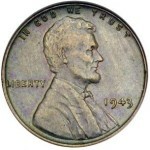 Easily counterfeited or clipped, these coins were quickly replaced by ones featuring a tree on their obverse. Three styles of trees were used over the thirty years of production: a willow (1652-60), an oak (1660-67) and, most familiar of all, a pine (1667-82). 1776 Continental Dollar1934 Ten Dollar Bill - "Not Stamped"